Do children REALLY keep you young? I had a lovely evening with an old friend on Friday night. It’s been nearly 4 years since we’ve got together, so I’ve been looking forward to a few precious hours footloose and fancy free in London for weeks. Factor 50 sun cream and some tiny fingerless gloves… because you never can tell what the weather’s going to do, can you? Oh, and a cereal bar, in case hunger strikes. Antibacterial gel (cleanliness is next to godliness…), jeans and knickers in a size considerably smaller than mine, in case of accidents (not mine). A ball of knitting wool, and some miniature cutlery. When they say children keep you young, I think they must mean other people’s children. Your own children make you, or at least your handbag, decidedly middle-aged. I can only be grateful that I didn’t go anywhere where I might have to endure a bag check! Of course, on the upside, I managed a couple of “granny squares” on the way home. Even my silver linings sound middle-aged! Remember when you went to places where they stamped your hand so you could get back in? We had stamps at our student union bar and there was always a great rigmarole as we nominated the most trustworthy looking person to pay and get their hand stamped, and then the next 45 mins trying to reproduce it, artfully smudged, so everyone else got in free and save the extortionate Â£1 entry (I have since discovered that this was the art student approach to deception. Mr MilkChic reliably informs me that engineers use solvent to copy and re-stamp). You could always rely on an event with hand stamps to involve alcohol, and friends, and silliness. So when on Sunday morning I woke up with a purple smudge on my hand from a stamp that wouldn’t budge no matter how hard I scrubbed it and no hangover, I felt a nostalgic euphoria – result! But where would the mum of a toddler have been out gallivanting to get a stamped hand on a Saturday? Were there late nights and babysitters involved? Did we creep in at the dead of night, tripping over shoes, whispering loudly and trying not to wake the children? Erm, no. We went to a vintage fashion and homewares fair. My stepson “dragged” me along, having been targetted in the street by someone with flyers (proud!). We went en masse – me, Mr MilkChic, the lumpy one & his girlfriend, the curly one and the small one. 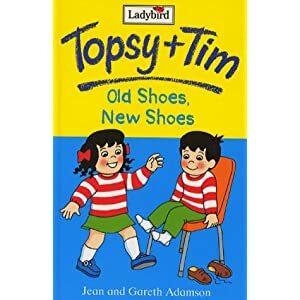 Small one fell in love with a pair of black, clumpy childrens shoes which looked just like the ones that Topsy refuses in her Topsy & Tim’s New Shoes book. Oddly enough they were in her size, but we couldn’t justify Â£15 for them and they had too much of a heel for a 2 year old, no matter how sensible Topsy’s mum thought they were. Still reeling from the realisation that the only places we get stamped now are vintage fairs and indoor play areas, I have only been able to console myself with the lovely handbag that Mr MilkChic treated me to.